Joey O'Kane may be the last of the three O'Kane brothers to graduate from the University of New Brunswick, but no matter how far off they venture, the O'Kane name will not soon-be forgotten around campus. From Saint John, N.B., Josh, Jon and Joey all graduated from the University of New Brunswick in Fredericton at the top of their class and made the best of their time at university by being active leaders on campus. Josh, who is the oldest at 26, graduated in 2009 with both a bachelor of science and a bachelor of arts degree. He was the recipient of the MacLauchlan McKenzie Student Leadership Award in 2008 and was a residence proctor in both Neill and Mackenzie Houses. He caught onto journalism at UNB, writing news for and eventually becoming editor-in-chief of Canada’s oldest student publication, the Brunswickan. He also served two years as national bureau chief and chair of the Canadian University Press. After graduating with a journalism degree from Ryerson University, he stayed in Toronto and recently was hired on as a business reporter with The Globe and Mail. Jon earned a bachelors of science in physics from UNB in 2010 and will be completing his Juris Doctor from Osgoode Hall Law School this year. He is a UNB Currie Scholar, won the CC Jones Prize for Mathematics while at UNB, and was named a UNB Sir Howard Douglas Scholar. During his time at UNB, he served as both vice-president external and president of the Student Union and sat on the boards of both the New Brunswick Student Alliance and the Canadian Alliance of Student Associations. Along with Student Union, Jon was heavily involved with the Lady Beaverbrook Residence and both a member of the house committee and as a proctor. 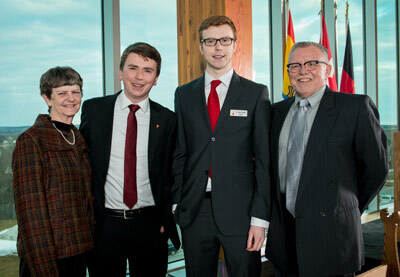 He worked for one year with the UNB Board of Governors and two years on the Board of York University. He will soon be joining the firm of Stewart McKelvey in Saint John. Joey O'Kane had big shoes to fill coming to UNB, but he too managed to make a name for himself on campus. With his parents and at least one brother looking on, Joey will be graduating from UNB on May 29 during Ceremony B where he will receive a bachelor of business administration degree focusing on entrepreneurship, marketing and human resources. Not only were his grades top-notch throughout his academic career at UNB, Joey was also named a UNB Sir Howard Douglas Scholar and was actively involved by being the chair of orientation and representing the student body on UNB’s Board of Governors. Joey was also the president of the New Brunswick Student Alliance during the 2011-2012 term, while fulfilling his duties with the UNB Student Union as vice-president external. As a member of UNB's Activator Program, Export Partnering Program, and winner of numerous entrepreneurship scholarships, Joey is interested in pursuing his entrepreneurial aspirations and an MBA in the not-so-distant future.